KANSAS CITY – Matt Millsap freely admits he made up the word, “theoludology” when he chose it as the topic of his doctoral dissertation in systematic theology. Google search the term, “theoludological,” and literally every single result includes his name. Broken up into its roots, his topic becomes clearer, even if doesn’t become easier to pronounce. “Theo-” and “-ology” are no-brainers. “Ludo” is the Latin root for “game” or “play.” Mashed together, Millsap created a new discipline: thinking about video games from a theological point of view. Millsap is the assistant director of library services at Midwestern Baptist Theological Seminary in Kansas City, and teaches courses such as Christianity and the Arts at Midwestern College. As readers might already have guessed, he is also a bit of a video game nerd. Literally every surface of his office is piled high with systematic theology textbooks and academic journals, but his home entertainment center is piled high with a PlayStation 4, Xbox One and a Nintendo Switch. While some may dismiss the gaming as a time-wasting holdover from boyhood or a trivial escape from the rigors of academia, Millsap would ask them to press pause. Millsap argues that theologians regularly interact with media and the arts. Film and television are common topic for theological dialog, and religious thinkers have been pondering painting, literature, sculpture and music for hundreds if not thousands of years. Why isn’t the same true for an art form that’s emerged in the past 40 years? 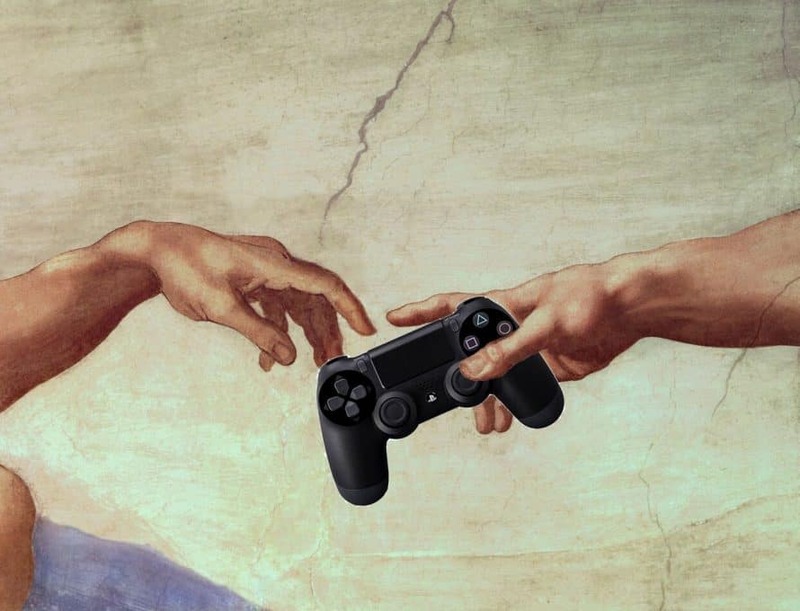 One reason he feels the time has come to seriously consider video games with God in mind is that they have seriously evolved over the generations as technology improved. So there basically wasn’t one. Games were simple and straight forward. Players dropped Tetris blocks into place, urged a hapless Frogger across a busy road, or frantically pressed UP UP DOWN DOWN LEFT RIGHT LEFT RIGHT B A START to cheat an early shoot ‘em up. Forty years later, gone are the primitive pixels of Pong or Pac-Man and the simple sprites of Super Mario or Space Invaders. Indeed, it’s now common for the most popular and awarded games to feature a 10-, 20-, or even 50-hour storyline complete with motion-capture acting and top-tier voice talent. A compelling single-player story can overcome technological weaknesses or the occasional gameplay flaw. Many high-profile games are essentially interactive movies. And just like the opening level of an unfamiliar game, Millsap has come up with a tutorial for tackling these story-focused games and figuring out what they might communicate about God and then critiquing it. So he came up with a game studies – or, ludological – analog to the Wesleyan Quadrilateral, a traditional Methodist way of approaching Christian theology that begins with Scripture, then folds in reason, experience and tradition. Being a good Baptist, he keeps Scripture in the primary slot – an “extraludic norm” if you want to be fancy about it. With that in mind, Millsap cautions that Christians should be discerning when they choose which games to play to ensure no content will cause them to sin, just as they should do with movies or literature, and limit games to their appropriate audiences. After the overarching umbrella of scriptural primacy is accounted for, game studies had its own versions of tradition, reason and experience. Gaming’s traditions, or doctrines become a sort of gaming literacy. Once a player “gets” how a certain genre of game works and is structured, they know what to expect and how to approach the next one. One doctrine informs the next. “It’s much like how you can’t talk about Christology (the doctrine of Jesus) without having that bleed into your soteriology (the doctrine of salvation),” Millsap said. Reason equates to game mechanics and structure: the press of a button will always do this, the nudge of a joystick does that. Just as there is order and structure to the Universe as God created it and He has given mankind reason to ponder it, video games follow the rules of their own creator. Experience’s ludological twin is what Millsap calls player identification and agency. Millsap’s go-to illustration of this type of theological thinking is the game, “Journey.” A title originally released for the PlayStation 3 in 2012, it is also available for the PlayStation 4. Players take control of a mysterious, unnamed, hooded character and… go on a journey. You wake up, see a light on top of a mountain, and start your story. That’s it. The Game of the Year according to the Academy of Interactive Arts & Sciences, it racked up more than its fair share of praise: various gaming publications called it “a hallmark of excellence,” “a glorious, thoughtful, moving masterpiece” and “mysterious and beautiful.” Not bad for a game with no dialog, no instructions and no text. Players experience the creation and inherently know the game’s designers have something planned out. So what’s the point? He’s not saying that mashing buttons is a path to a deeper understanding of God or a defeating the next boss is a discipleship tool. The idea is just that it’s worth considering those stories and scenarios that gamers encounter from a theological perspective.